Thoughts Zeitoun by Dave Eggers*, McSweeney’s Books 2009, 335 pages. Nonfiction. WHAT’s it ABOUT: This book is about one particular American family living in New Orleans and their experiences with Hurricane Katrina 2005. That’s all I knew going into it and that’s all I will tell you here. WHAT’s GOOD/NOT so good: Even knowing (safely, only from watching TV!) how devastating Hurricane Katrina was, I had no idea how far the pendulum of response swung to deal with all that was needing to be addressed. I was shocked and saddened and appalled. I was caught up in wondering the hows and whys. I still find myself having the pendulum of reaction swinging back and forth, pro and con to what I really think about this book. Well written, but …. what? It was presented as this family’s experiences and so I cannot accuse it of being one-sided. In fact, Eggers’ notes at the end discuss his fact-checking and cross-interviewing so we are not sold going in that it would be more – it IS accurate for Zeitoun as he shares it. FINAL CONCLUSIONS: One more reminder that the world is full of good and bad and the range of perspective is all over the map. We can all see the same thing but the interpretation can vary wildly. What I take away from this is how uncommon common decency can be and how I personally desire to be more kind, considerate, respectful and calm in the face of situations out of my control or understanding. RATING: My initial reaction was to rate this a four slice of pie: and I think I’ll stand by that for now. I admire Eggers and wish the Zeitoun family all the best. What a horrific ordeal. OTHER REVIEWS: I was quite impressed by Asylum’s review. Both Eyes Book Blog listed this in her top 500 but sadly, no review. From a blogger who wouldn’t/couldn’t finish the book: Citizen Reader. For a questioning look at the stories told and how: One Minute Book Reviews. For all the rest and more: Fyrefly’s Book Blog Search Engine Results. * I’ll admit that I have attempted and failed to get through Egger’s A Heartbreaking Work of Staggering Genius. I’m baffled, really, why I didn’t love AHWOSG a because I thought it sounded awesome. I’m a Gemini – I always blame these crazy misunderstandings with myself on the fact that I was born in June. *** Again, I love the random connections that link books I read. This one features a captain of large international ships, our main character Abulrahman Zeitoun’s older brother Ahmad Zeton and the most recent book I read also features a non-American tanker ship captain who helps rescue a man lost at sea in a crazy storm in 2005. I couldn’t get into AHWOSG either and unfortunately the experience has put me off of Egger’s books. I have been tempted to read What is the What?, and this sounds good as well, but I still feel apprehension when I think of reading him. If it’s helpful, you don’t really get a sense of the author in this book like you have with AHWOSG. 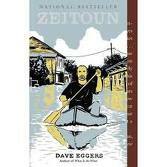 I don’t have much desire to read Zeitoun, but I thought What is the What was quite good. Good to know. I’m curious, why would you recommend WITW and also why not interested in Zeitoun? I’ve never read any Dave Eggers! I’ll have to investigate this one. You just might like this one. It has all of those things. Dear Care, I’m glad to see you rated this 4. I am a fan of Eggers and while I loved parts of Staggering Genius and didn’t others, I always look forward to reading him. I echo some of the others regarding What is the What. I super loved that book and would recommend it to everyone. I’m looking forward to reading Zeitoun, it’s sitting on my shelf, waiting for the right time..
I’ll admit, I thought I would read What is the What before this one. Still might get to it. I’ve been wanting to read this book for awhile now. I even started it but returned it to the library unfinished because of time constraints. I will try again because of your review. Thanks! I have been meaning to read this book. One of my younger sisters lived in NOLA during Katrina so I have a special interest in this subject matter. It had less of the whole big Katrina/NOLA mess than I expected even if this is one aspect of it. I guess that doesn’t make much sense. Anyway, this had less discussion of the big overall -ness. I really enjoyed this one. I think Eggers does his best work when he’s telling someone else’s story. I will read more. I’m more and more inclined to read What is the What (I admit I adore the title) now that I’ve gotten such great comments here.